If you’ve ever been asked, “Hey buddy, what cave did you crawl out of?” it’s usually because you’ve done something particularly crude or insensitive, hence, you’re a caveman. 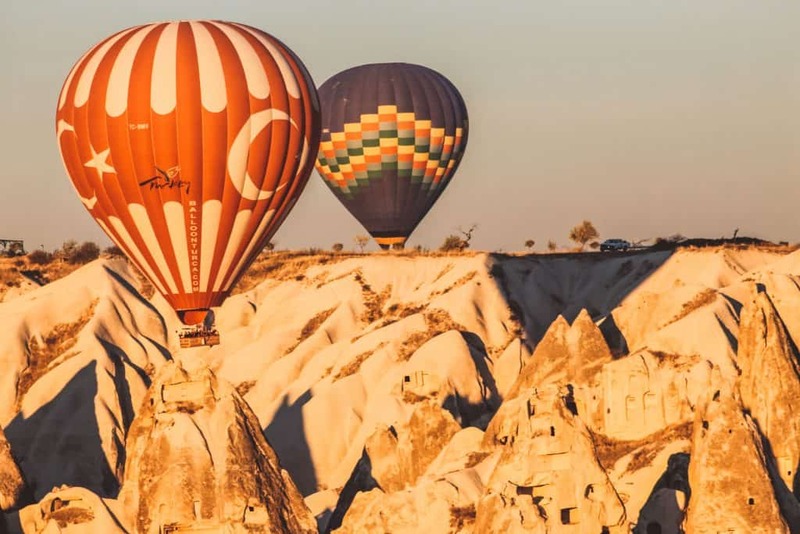 The few times that question has been posed to me, I lacked an appropriately witty and guilt-deflecting retort, but after a trip to Turkey’s Cappadocia area and staying at a few of the best cave hotels in Cappadocia, that’ll no longer be the case. 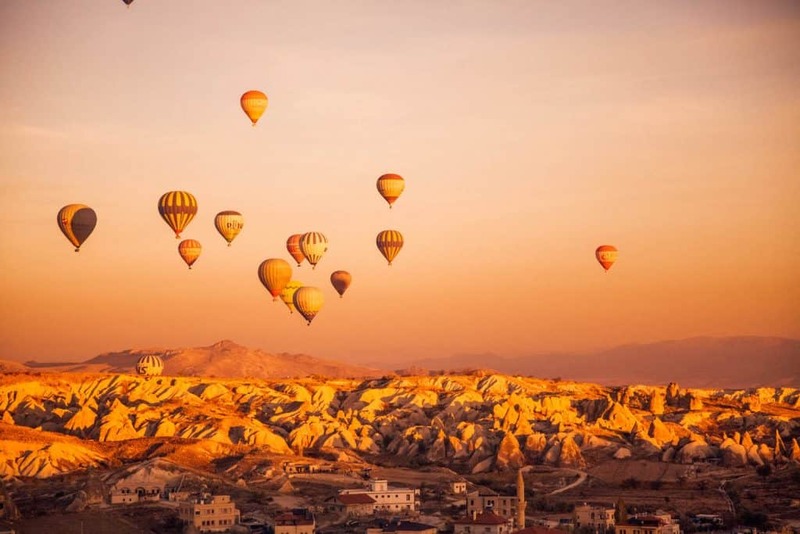 Located in central Turkey’s Anatolia region, Cappadocia consists of a towering plateau studded with dramatic volcanic peaks, of which Mount Erciyes is the tallest at nearly 13,000 feet. Thanks to its inland location and elevation, the region receives little rain and is considered semi-arid. It’s also subject to very hot summers and cold winters. 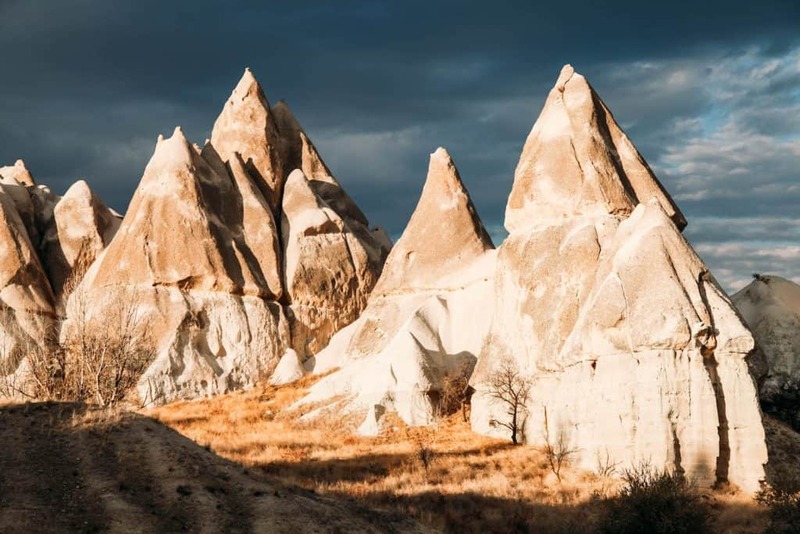 With its magnificent natural rock formations, fascinating history, and unmistakably unique architecture, choosing a place to stay in Cappadocia may seem a bit overwhelming, but fear not; no matter where you stay, you’ll likely be thrilled, as nearly all the hotels and suites are a melding of the historic and contemporary, natural and manmade, and comfortable and cave elegant. Below are a few of the 10 best cave hotels in Cappadocia, along with helpful links, and a few things that should be on your Cappadocia itinerary too. Cappadocia is almost smack dab in the middle of Turkey. Since Turkey is pretty much in the center of the world I would say that Cappadocia is almost the exact center of the world. But im no geographer. If you want to hop on a bus tour from Istanbul to Cappadocia you can plan to widdle about 10-12 hours of your life away. Fortunately, we found a cheap $25 flight with Turkish Airlines from Istanbul and never looked back. The two main airports to reach Cappadocia are Nevşehir Kapadokya Airport (NAV) and Kayseri Erkilet Airport (ASR). Both are serviced by Turkish Airlines and neither are located directly in Cappadocia. You will have to take bus to Goreme once you land at the airport. Once you exit the airport there are dolmus’s waiting outside to take you where you need to go. There are options to set this up in advance, but we had no problem arriving and telling the drivers that we were going to Goreme. The cost was 10 Turkish lira and took about an hour. There is the main bus station in town which will connect you to Istanbul, Ankara, Bursa, Izmir, Pamukkale, Konya, and Antalya. 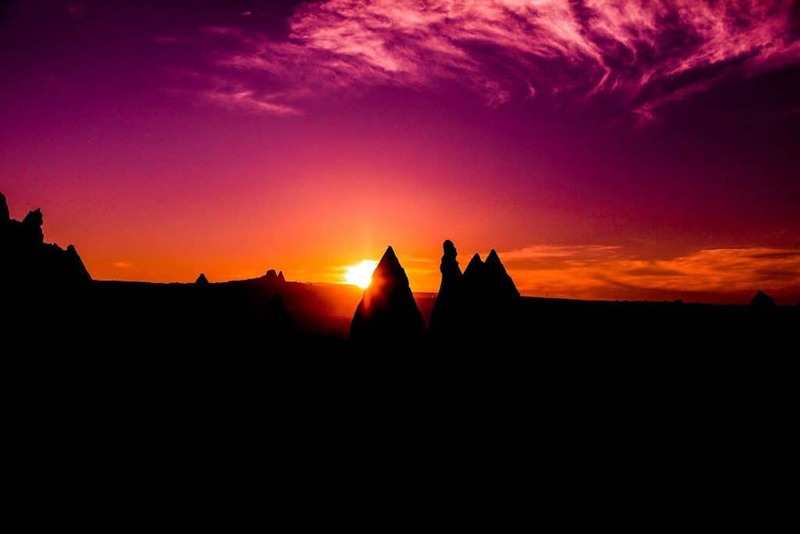 Goreme is “the place to be” for tourist in Cappadocia. 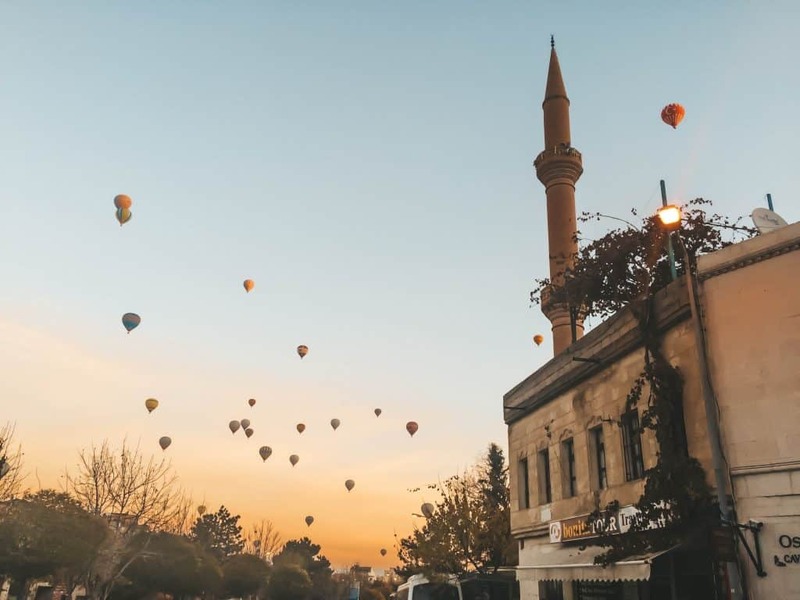 It is where the balloons can be most easily viewed, has hundreds of guesthouses and restaurants, and is the jumping off point for many day trips. Goreme is completely walkable in 10 minutes and there is one grocery store, although it is very limited. There is a main bus stop smack dab in the middle of Goreme for entry and exit points. The other main towns around Goreme are Uçhisar and Ürgüp. Both can be reached by dolmus, taxi, or an enjoyable hike. With a list of awards and accolades too long to mention, the Museum Hotel is a place that will make memories that last a lifetime; it’s definitely one of the best luxury cave hotels in Cappadocia. With 30 spectacular rooms and suites, Museum Hotel is part natural and historical museum and part ultra-exclusive resort. In 1998, the hotel’s owner undertook an extensive renovation to transform the caves and existing buildings into a hotel unlike any other. Not an easy task, considering the nearby competition. Generally accepted as the first true luxury hotel in the area, it sparked an arms race of sorts as the other hotels scrambled to catch up, which they’ve largely done. Located in Uchisar — a few kilometers from Goreme — the hotel features unmatched amenities and views of the valley and surrounding country. There’s an outdoor pool that’s open year-round too; it’s even heated in the winter months. Operated by a Turkish family whose goal is to make your stay at Ottoman Cave Suites a memorable one, the hotel offers flowing rooms carved into the surrounding stone walls, decorated with traditional Turkish kilims, which are traditional woven tapestries made in countries that were ruled or influenced by the Ottoman Empire. The rooms feature in-floor heating, seating areas, fast Wi-Fi, and complimentary coffee and tea. Some of the rooms have spas, private balconies, and fireplaces, so check carefully before you book. The hotel provides a breakfast menu from which you can order traditional Turkish food, or a continental buffet if you’re not feeling particularly adventurous. If you fancy a bit of exercise and exploration, put on your comfy shoes and head into town. Just listen for the chatter of the locals and follow your nose to one of the many quaint cafes in the area. Though the words ‘cave’ and ‘premium’ aren’t often associated with one another, however you’ll see that in the case of Kayakapi Premium Caves, they go together like peanut butter and jelly. 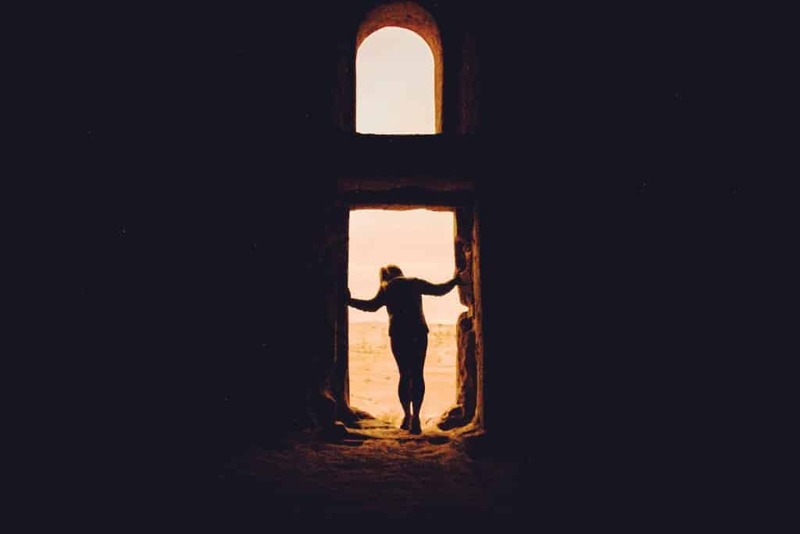 Located less than a mile from the town center of Urgup, Kayakapi Premium Caves are among the most historic, comfortable, and elegantly appointed of any in Cappadocia. Just a half mile from Urgup’s town center, the rooms are set in ancient and lovingly-restored caves. Featuring in-room coffee machines, flat-screen televisions and in-floor heating, it’ll be the perfect place to collapse and soothe those tired feet at the end of a long day of taking in the area’s majestic scenery and rich history. As you’ve probably already guessed, the cave hotel competition is pretty stiff in Cappadocia. With so much history, hospitality and exotic elegance at your fingertips, it may seem like there are just too many wonderful choices. If, however, after lots of gut-wrenching deliberation, you’ve decided that Yunak Evleri Cave Hotel will be your home away from home on your Turkish adventure, then rest easy, because it’s among the most historic best hotels in Cappadocia. The hotel’s humble beginnings date back centuries, when brave souls called the subterranean labyrinths home. Though the accommodations were surely more spartan back then, you’ll find they’ve done a remarkable job keeping that historic feel, while appointing the rooms with the right amount of contemporary amenities so you won’t forget that it’s the 21st century. A boutique hotel in the town of Goreme, guests agree that Artemis Cave Suites is one of the best cave hotels in Cappadocia. Described as ‘perfect, breathtaking and convenient,’ and featuring many of the same in-room amenities as other cave hotels in the area, Artemis Cave Suites stands out for its tranquil garden and the terraces from which breathtaking views of the city may be viewed. Watching the sunset from the rooftop garden shouldn’t be missed. The staff can tell you about local tours and sites, and can even book them for you. If you’re looking for where to stay in Cappadocia that will help you create an amazing Instagram photo it’s Sultan Cave Suites. You’ve likely seen this hotel tagged before as it’s made the rounds on social media by a few large grammers. In the town of Goreme, perched atop a hill with the picturesque town resting peacefully below, you’ll feel like you’ve been transported to a different era when you step outside your room at Sultan Cave Hotels. The views are especially dramatic when viewed in the shadowy and fading light at sunset, preferably with a glass of wine in hand. Visitors specifically commented on the mystical rooms, helpful staff, and the stunning photo-ops from the rooftop terrace, especially with a sky full of hot air balloons in the distance. Ask the staff at the front desk when is the best time to catch the balloons, as it’s something you won’t want to miss; they’re often only present early in the morning. With recent renovations complete, Terra Cave Hotel’s rooms look like they’ve been carved from the underlying rock through ages of natural erosion. Though that may partly be the case, the skillful craftsmen in this area of Turkey certainly helped the process along a little bit, and the end product is a stunningly elegant mix of the natural and manmade worlds that complement each other perfectly. You’ll appreciate the room’s amenities, like contemporary bathrooms with walk-in showers, fireplaces, seating areas and speedy Wi-Fi that’ll allow you to send stunning photos to jealous in-laws and plan your adventures for the following day. 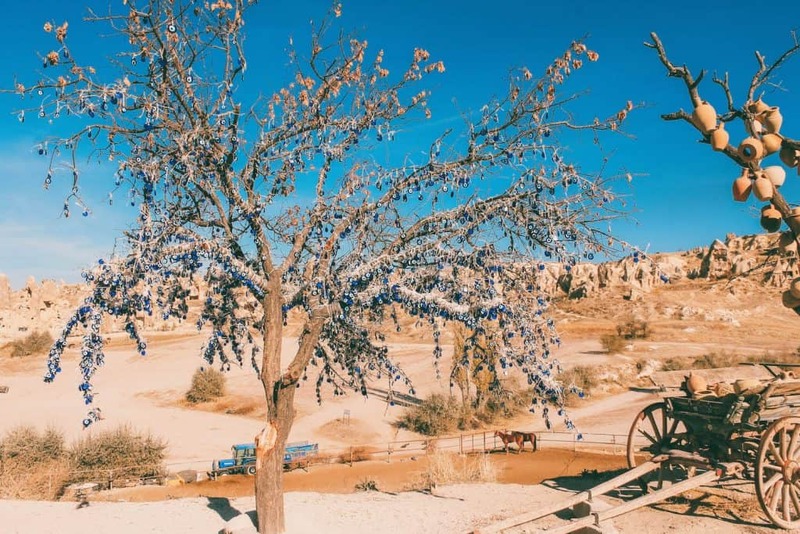 Close to central Goreme, the town’s attractions are a short walk or bike ride away, as are horseback and balloon tours – the latter of which will give you views that seem otherworldly. With amenities that are even a cut above many of the surrounding hotels, Kelebek Special Cave Hotel is another one of the best cave hotels in Cappadocia. Boasting an outdoor swimming pool and traditional Turkish bath, you may be tempted to grab a good book, ring room service for a pot of coffee, and cancel your plans for the day. The suites are roomy by cave suite standards; many of them have fireplaces and private balconies which give unrestricted views of the surrounding town, landscape, and blue Turkish sky. Decorated in a mix of traditional and contemporary, the rooms are built for comfort. There’s also a sauna on-site and massages can be booked with experts, whose hands will turn those tense muscles into jelly in no time, after which you can enjoy a glass of wine or Turkish coffee at the hotel bar. With an indescribably unique feel, you may just feel like it’s the 17th century and you’re on a secret mission for the sultan with the fate of the world hanging in the balance. Perhaps that’s a bit dramatic, but the point is that a night in one of the rooms at Cappadocia Cave Suites may make you forget your boring life, if only for a few hours. The thoughtfully and luxuriously appointed rooms and bathrooms will pamper you, and some of the larger and more expensive suites have separate living rooms and fireplaces, which will come in handy on a chilly Turkish night after a long day on your feet. The on-site restaurant offers an accommodating mix of Turkish and international dishes, so even the pickiest eaters will be able to find something they like. The hotel is located near both regional airports and the concierge can schedule a shuttle bus to either when it’s time to check out. Is it possible that there’s enough room in the quaint downtown of Goreme to fit another world-class cave hotel? If that’s a question you’re asking, then, believe it or not, there is, and it’s the Travelers Cave Pension. Boasting an orderly and visually pleasing set of angular rooms, set on terraces with wonderful views of the rock formations for which the town of Goreme is famous, the Travelers Cave Pension is located within walking distance of all the town has to offer. With amenities like flat-screen televisions, contemporary bathrooms, and free Wi-Fi, there are also Turkish baths and restaurants nearby, and the same tours and activities are available here. For something different and exhilarating, try an ATV tour, which is becoming more popular. 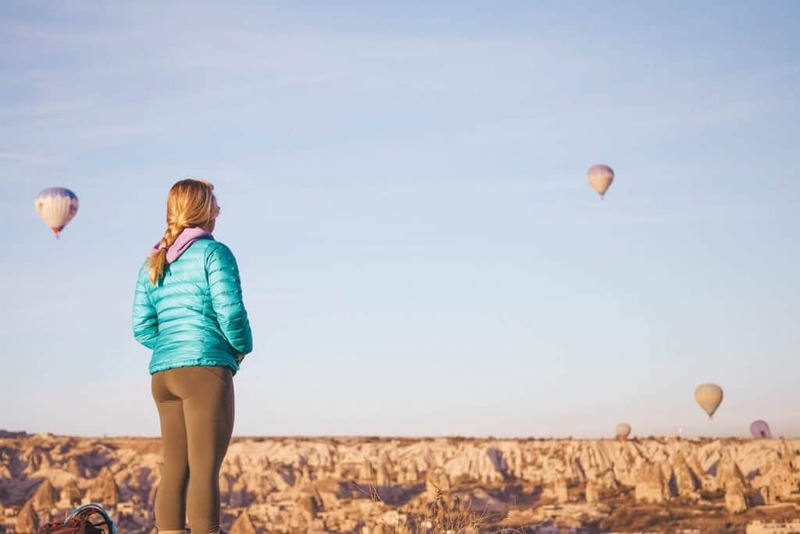 With so many things to do in Cappadocia, boredom won’t be an issue. 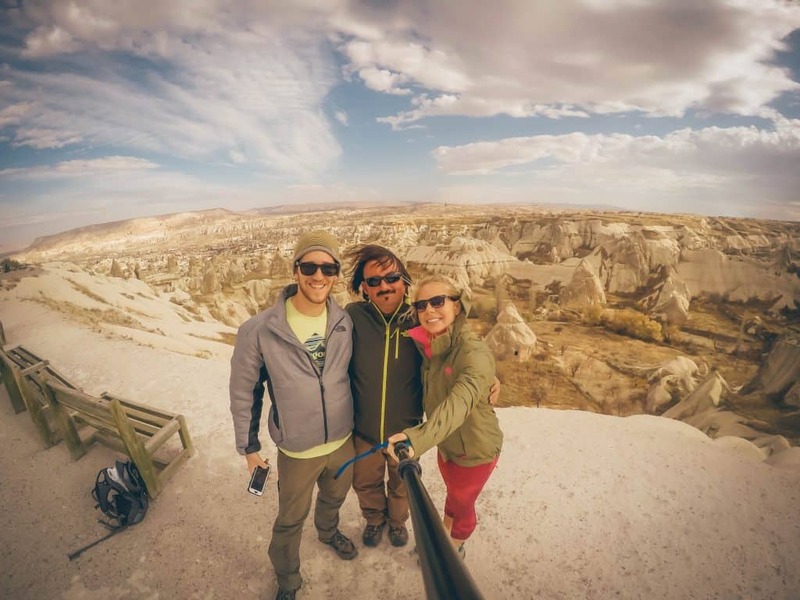 One of the first things many visitors do upon arrival is to book a tour of Goreme National Park. Chock-full of awe-inspiring rock formations and ruins of ancient cave dwellings, this site will give you invaluable insight into the local culture. It can be hot and crowded in the summer months, so remember to bring a waterbottlewaterbottle and comfy travel shoes. There are descriptive plaques at the sites so you’ll know what you’re seeing, and there are even restaurants and cafes, though they’re on the pricey side. The Goreme Open Air Museum is a UNESCO World Heritage Site for good reason. 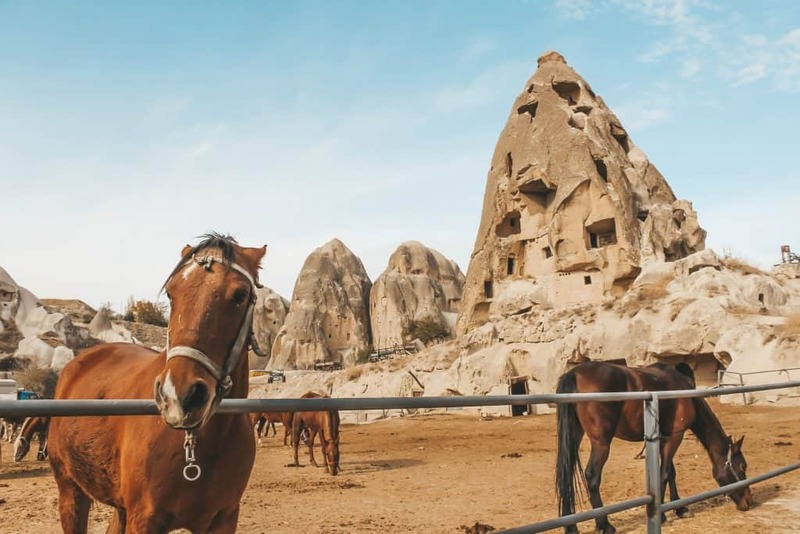 A Cappadocia must-do, the museum is a monastic settlement from the 10th century, and home to a collection of amazing churches crafted from the area’s volcanic rock. Many of the churches sport amazingly detailed and still-vibrant murals on their walls and ceilings, some of which depict biblical stories. The Avanos pottery and ceramic shops are family-run artisan shops in the town of Avanos, many of which have been in continuous operation for many generations. On the shores of the longest river in Turkey – the Red River – it’s the red clay so prevalent in the area from which the craftsmen create their masterpieces, which include jars, vases, jugs, and mugs, to name a few. It’s the place to get souvenirs for family and friends. The valleys have great trails set up for mountain biking, and ranging from beginner to advanced. Mountain biking proved to be a great budget friendly option for the day. There are plenty of bike shop rentals around town, just make sure you find a reputable company and always test the bike beforehand. 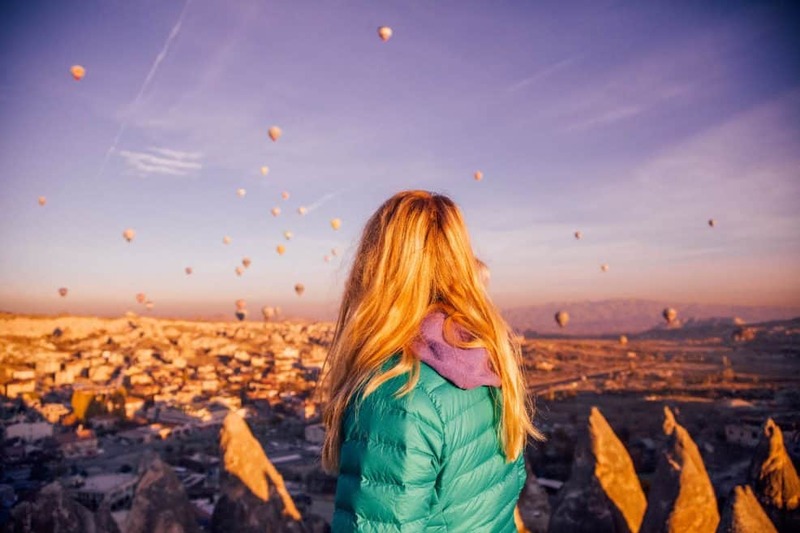 For those brave souls who aren’t afraid of heights, an excursion in one of Goreme’s many hot air balloons will give you jaw-dropping views of the surrounding town, valleys, and rock formations. Remember to take a hat, sunglasses and of course your camera! Book a tour here! What better way to cap a great day off than with a traditional Turkish night. The dancer’s garb and hypnotic moves – not to mention the music, architecture, and aura – will have you checking the calendar in your phone to see if time hasn’t gone a few centuries in reverse. Found in many of the local cave restaurants, the dance shows are another absolute must-do in Cappadocia. We chose this as an alternative to the underground city of Derinkuyu. Derinkuyu is 35 km south of Goreme and is not convenient to get to without a tour or your own transport. So instead, we chose to bike to Cavusin. A half hour hike from Goreme will bring you to this little town. The town is very small and charming in itself, but it also is the site of the Church of St. John the Baptist on top of a hill. This is the biggest church in Cappadocia and deserves some exploring. (It’s also free to enter and offers stunning views from the top!) Highly recommend! A visit to the Devrent Valley will be a nice change from so many wonderful cultural activities. Don’t expect to find ancient churches or cave ruins here; this wonderful spot is home to natural rock formations only. Resembling the surface of the moon, or perhaps Mars, the landscape is characterized by towering monoliths, many of which look like animals, though you’ll need to use every ounce of your imagination to see the resemblance. There’s even one that looks like the Virgin Mary holding baby Jesus, according to local lore. 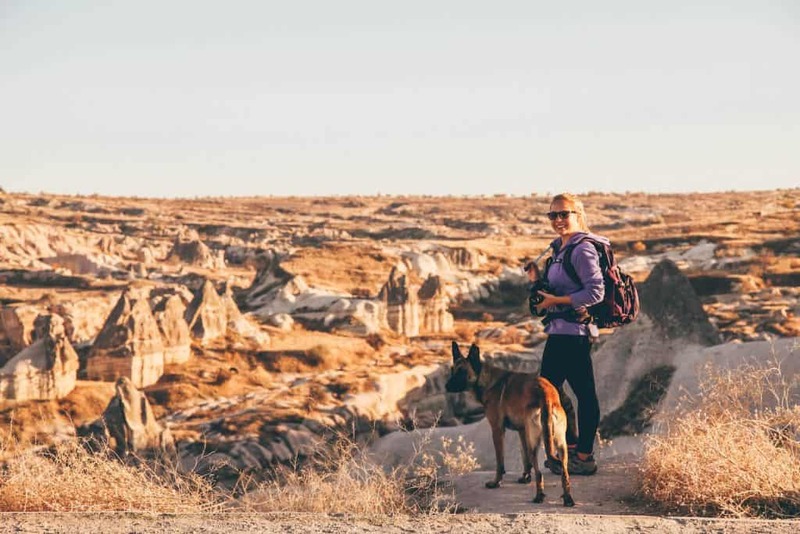 There are so many wonderful hiking trails around Cappadocia you could spend weeks here and never get tired of the view. We were only here a week, but almost every day we managed to get out on some amazing hike. A few of our favorites are Love Valley, Pigeon Valley, Red Valley, and Sword Valley. Don’t ever go hiking without a camera, a full water bottle, good shoes, and a light jacket. It may be hot during the day but as soon as the sun sets it gets chilly. The best thing about hiking is it’s free and a workout! Wondering what to wear in Turkey? Check out our ultimate European packing list. Travel Insurance: We never travel without travel insurance from World Nomads. Natasha is a bit of a worry wart and would rather stay safe than sorry. World Nomads is ideal for flexible and great plans! Adapter: Power sockets in Turkey are type C and F, like most of Europe. You can pick up this travel adapter. Currency: Turkey uses the Euro. ATM’s are located in the main towns and the majority of businesses run on cash due to strict bank laws in Greece. 18 Fun Things to do in Istanbul!